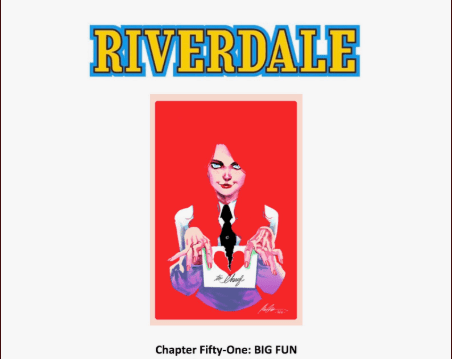 Riverdale is getting musical, again! 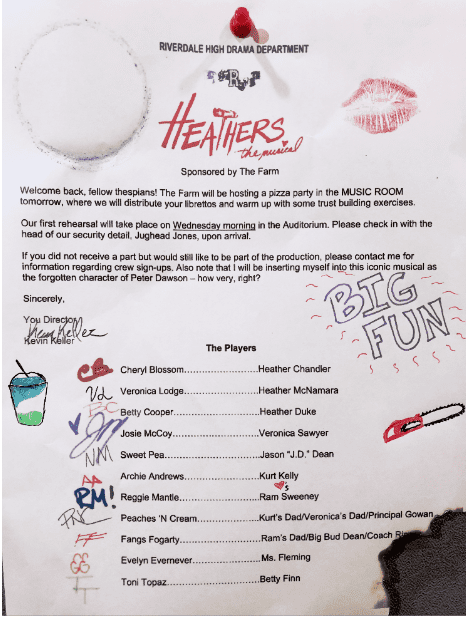 They are keeping with their murderous teen theme and this time they will perform Heathers: The Musical. 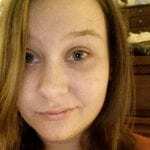 The musical is based on the 1989 film starring Winona Ryder and Christian Slater about three girls named Heather who were the bitchiest girls in all of Ohio until newcomer Veronica and her boyfriend decide to give the Heathers what they deserve. Everyone? Yes, even Jughead Jones! Check out the cast list. Kevin Keller (played by Casey Cott) will direct the school production, which will feature Josie McCoy (Ashleigh Murray) as Veronica Sawyer, Cheryl Blossom (Madelaine Petsch) as Heather Chandler, Veronica Lodge (Camila Mendes) as Heather McNamara, Betty Cooper (Lili Reinhart) as Heather Duke, and Sweet Pea (Jordan Connor) as J.D. Wait, Archie Andrews will be back in time for the musical? So, he survived the bear attack? That’s wonderful, I knew it! 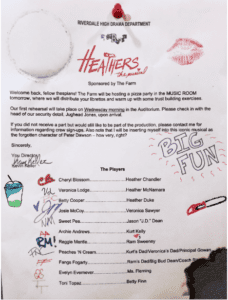 The Heathers: The Musical episode titled “Chapter 51: Big Fun” will air March 20.